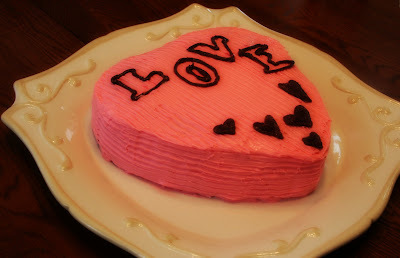 This cake is decorated with the celebrated word of the season: L.O.V.E. 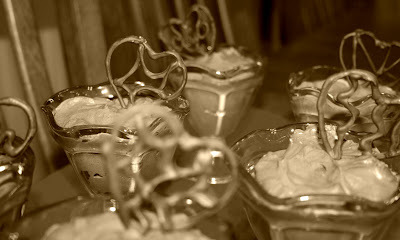 The hearts and letters were melted chocolate chips that were piped on using cookie cutters for forms. 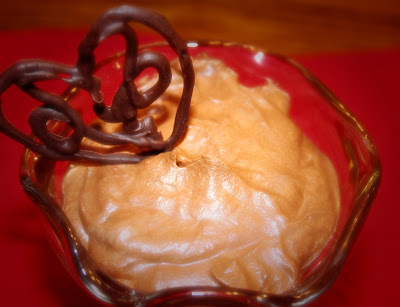 I made this light but rich mousse using allrecipes.com too. It's described as "heaven on a spoon". Martha Stewart Living February issue had this idea for the hearts and it was simple and fun to create! 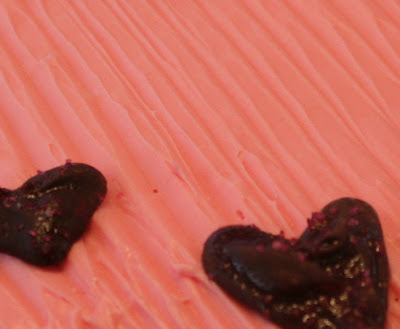 Melt semi-sweet chocolate and pipe it onto parchment paper into your desired shapes. 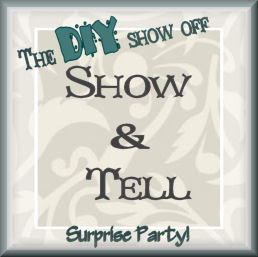 Wait for your creations to completely dry before transferring them to desserts. I made each of my hearts different inside with various designs. Don't forget to enter my Tunkables giveaway! It's such a fun and unique treasure! The giveaway ends on Valentine's Day. 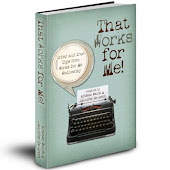 Hi, sweet girl, these are absolutely fabulous! Loved your gorgeous desserts. You have certainly been busy. I want one of those truffles BAD! LOL! These goodies look so GOOD! 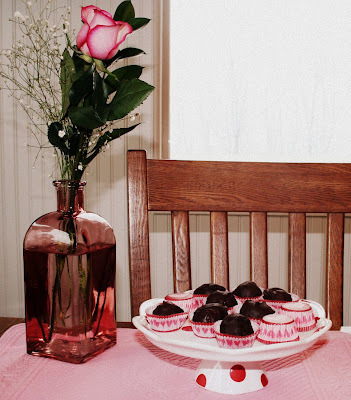 I may have to try those Oreo Truffles...for my eldest son's Valentine birthday. 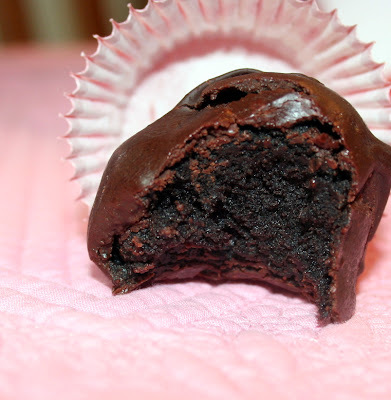 I just made Oreo Truffles yesterday and posted pics. Funny. This time I tried them using mint oreos too. Yum. Check out my pics. I used white choc for coating them. All those treats sure do look yummy. Thanks for sharing. I've got to get busy making Valentine goodies myself. 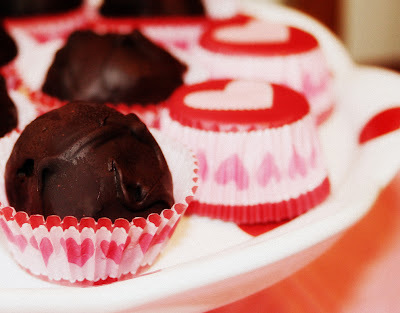 I've had the oreo truffles and they are so yummy. They look really cute in the heart wrappers! Looks great but this preggo lady needs chocolate asap now!!! you are so creative! 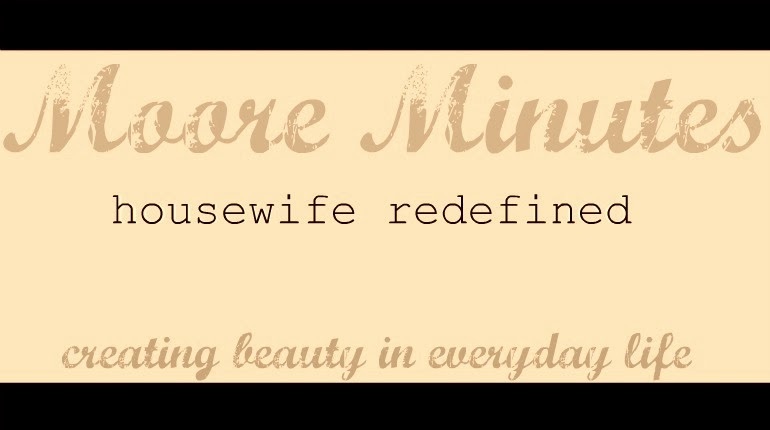 I don't have the patience for some of these things...but I do like to look! 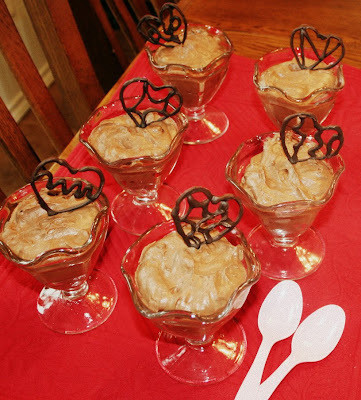 The chocolate mousse and pretzels looks great!! Wow,making me drool on my keyboard! Looks so yummy! Yum! I love the oreo cookie truffles. I've been planning on making those for my daughter's teachers for V-Day. I'm gonna use the pink chocolate to dip them in though and then cover some with various pink and red sprinkles. Fun! Love those MS hearts though and might have to use those for something I have planned for dinner with hubs! Oreo Heaven Balls! That's what those are! I know you made them for Valentine's Day, but I think they could be used as an "every holiday" staple! Glad to see you back. These look wonderful! Yummy! They all look so good!!!! Those candy liners are so cute! I noticed them right away. Everything looks so delicious! I adore those chocolate heart toppers! I've seen these truffles a few times now... I think I'm going to have to break down and make them for our next church lunch. 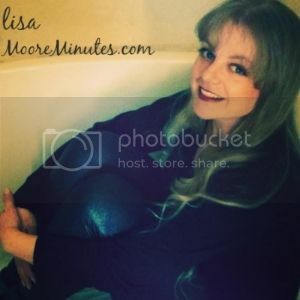 Lisa, I'm back by again for Foodie Friday, and those truffles stop me in my tracks every time. WOW! They look really, really divine! I need to try them. oh yummy. how do you make the oreo ones? i wanna try for myself. OH WOW!!! three YUMMY!!! treats and all of them chocolate. This post is AWESOME!!! I love chocolate.